Excited to act as a suitable companion for her friend Delphinia, who is traveling to New York to marry Brent Albright, Jemima Pitt finds herself caught up in the search for Delphinia's mother at the request of Brent's brother, Harley. Anne Perry is the bestselling author of eleven earlier holiday novels—A Christmas Hope, A Christmas Garland, A Christmas Homecoming, A Christmas Odyssey, A Christmas Promise, A Christmas Grace, A Christmas Beginning, A Christmas Secret, A Christmas Guest, A Christmas Visitor, and A Christmas Journey—as well as the William Monk series and the Charlotte and Thomas Pitt series set in Victorian England, five World War I novels, and a work of historical fiction, The Sheen on the Silk. Anne Perry lives in Scotland and Los Angeles. 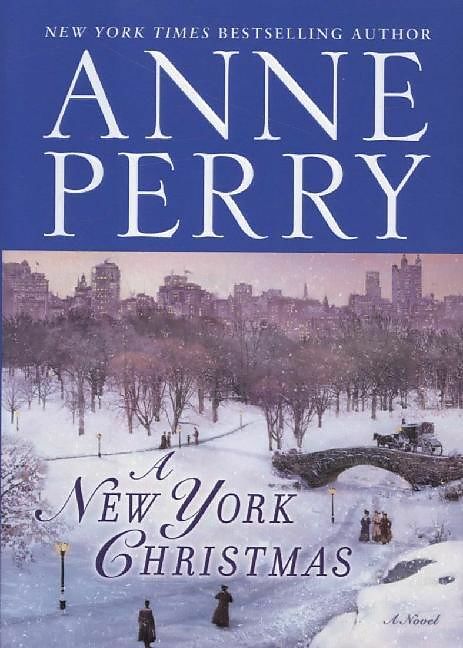 Anne Perry’s new Christmas novel is an irresistible tale of love, betrayal, greed, murder, and selfless devotion. For the first time, Perry’s annual yuletide offering is set in New York City—a sparkling young metropolis bursting with life, promise, and subtle menace. The year is 1904. Twenty-three-year-old Jemima Pitt, the daughter of Thomas Pitt, head of Britain’s Special Branch, is crossing the Atlantic. She is traveling with an acquaintance, Delphinia Cardew, who is to marry the aristocratic Brent Albright in a high-society New York wedding—a grand affair that will join together two fabulously wealthy families, titans of the international financial world. But Jemima senses a mysterious shadow darkening the occasion. Missing from the festivities is Delphinia’s mother, Maria, who is marked by disgrace. Nearly sixteen years ago, Maria abandoned young Delphinia and disappeared—and now the Albrights refuse to mention her name. But when Harley, the groom’s charismatic brother, asks Jemima to help him search for Maria and forestall the scandal that would surely follow if the prodigal parent turned up at the wedding, she agrees to assist him. From Hell’s Kitchen to Fifth Avenue, the Lower East Side to Central Park, Jemima trudges through strange, snowy streets, asking questions but getting few answers—and never suspecting that she is walking into mortal danger, from which not even a handsome young police officer named Patrick Flannery may be able to protect her. 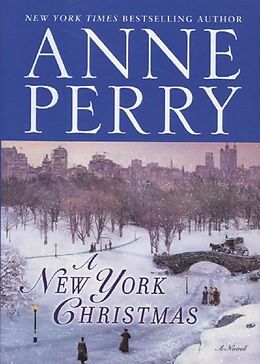 Once more, Anne Perry delivers a suspenseful, deeply moving novel that captures the essence of the holiday spirit. It was December 1904, and she was crossing the Atlantic to New York, where she would stay for at least a month. Mr. Edward Cardew had invited her to travel as a companion to his daughter, Delphinia, who was to marry Brent Albright, the son of Rothwell Albright, Mr. Cardew’s international business partner. It would be the society wedding of the year. Phinnie had grown up in London, as Jemima had, but was only nineteen—so it was not at all suitable that she travel alone. Mr. Cardew was an invalid and thus unable to make the journey himself. Someone older and wiser was needed, a person who could be both friend and chaperone. So Jemima had a passage to New York, and an invitation to stay with the Albrights. She had heard that New York was almost as big as London, both raw and sophisticated, a city bursting with life and the expectation of all kinds of new experiences. If she allowed herself to, Jemima might envy Phinnie her coming marriage, with its promise of happiness shared. Phinnie had met Brent Albright when he visited England the previous year. Within a month she was wildly in love. “He is handsome,” she said, as she and Jemima sat together at afternoon tea. “And a great deal more than that. He makes me laugh. He knows about so many things, and yet he is kind. I feel wonderful just thinking of him.” She was too discreet to mention that he was also very rich, so would not have courted Phinnie merely for her prospects. Jemima’s prospects were different, although she had to admit that was largely her own fault—or at least her own choice. Like her mother, Charlotte, she wanted adventure, interesting things to do, and, above all, love. She had no wish for a position in society. Perhaps, through tales here and there of her father’s experiences and opinions, she had learned too much of its frailties, and she saw even the most powerful of men and the most elegant of women as no less vulnerable to the weaknesses of human nature than the footman or the parlor maid. Her father was Thomas Pitt, head of Special Branch in London. He had begun his career as an ordinary policeman, solving crimes that were often exceedingly grim. Her mother had sometimes helped him in that. Jemima could remember the excitement of it, and the heartbreak. Later, when he was head of Special Branch, his work became more concerned with official government secrets and was much more mysterious, at least to Jemima. That had not prevented Charlotte from participating, something Jemima had always admired about her mother. In all the planning for this trip, no one had even mentioned Phinnie’s mother. One allusion to her a few months ago had made Jemima think she had died when Phinnie was very young, not more than two or three years old. Nothing specific had been said, but the reference had been hurried past in such a manner that she felt it would be clumsy to speak of it again. Phinnie must have missed her most of her life, but especially now. So Jemima was here to look after her, not only for the sake of propriety but also to be the friend and lookout her mother would have been. It was a trust she vowed to fulfill to the best of her ability. She would not let anything happen to Phinnie. She smiled to herself, and turned away from the railing, and the wind. Twenty-three, and I’m thinking like a policeman! You would be proud of me, Papa . . . and horrified! Shaking her head, she pulled up the collar of her coat and walked back toward the gangway down to the huge vestibule and the many formal rooms of the liner. She was passed by an elderly woman in a magnificent winter dress. The woman looked her up and down briefly, then nodded an acknowledgment. “Good afternoon, Miss Pitt,” she said coolly. Jemima was surprised that the woman knew her name, and not certain if that was a compliment or not. Then she realized it was actually Phinnie the woman knew. Jemima was merely “the companion.” That was not an entirely pleasant thought. “Good afternoon, Mrs. Weatherby,” she replied, lifting her chin a trifle higher, and walking on without waiting to see if there would be a conversation. She entered the cabin she and Phinnie shared, one of the more luxurious ones on the ship. It had both a bedroom and a quite comfortable-sized sitting room—Phinne was there, curled up in one of the chairs. She was smaller than Jemima and just a trifle plumper, with large, dark eyes—her best features—and thick hair, almost black, with a natural curl that Jemima envied. Jemima’s hair was a shining mahogany color, with gleams of amber she did not much like. And it had to be vigorously encouraged to have any curl at all. Phinnie looked up as Jemima came in. She had just finished writing in her diary, and now she carefully closed it and snapped the tiny lock shut. “I shall remind you,” Jemima replied, closing the door behind her and taking off her coat. She was glad to be in the warmth again. The wind off the ocean had a very sharp edge to it. A blistering retort rose to Jemima’s lips, but she bit it back with difficulty. Phinnie’s father was paying her fare, as she had been reminded twice already. She couldn’t afford to alienate his daughter. “Indeed, you are quite right,” she said, walking across to the cupboard where she would hang up her coat. She kept her back to Phinnie so the younger woman would not see the expression on her face. “I would be content with far less,” she added. Phinnie was momentarily taken aback. Phinnie’s smile vanished. Then with an effort she brought it back a trifle uncertainly. “You say that as if you think something awful is going to happen.” There was a tiny whisper of fear in her voice. Jemima felt guilty. She was having a wonderful trip at Mr. Cardew’s expense, no luxury withheld. “Indeed? And do they mean it as a compliment?” Jemima inquired with a slight edge to her voice. “Then I am surprised that you wish to copy me,” Jemima rejoined. Phinnie drew in her breath sharply and could think of nothing with which to reply. Jemima felt victorious, yet she had no pleasure in it. She went out of her way to be kinder to Phinnie that evening and listen to her without interrupting. She managed to sound impressed when Phinne was rambling on about the very considerable fortunes made by Albright and Cardew in their investments, and their climb from mere respectability to the pinnacle of power and influence in New York society. “Do you think so?” Phinnie said eagerly, the warmth back in her eyes. That Jemima definitely envied her. She had met a considerable number of young men, and liked many of them well enough, but she had never really been in love. She had felt sparks, and excitement, but it had always been brief, and never accompanied by the deep liking that she had seen between her parents, the kind of friendship that strengthens with time and shared experience. She believed such friendship was the foundation of all the love that mattered. Perhaps that was why she found it so difficult to meet someone she wished to marry. She could not settle for something that seemed far less than the love she had seen in her own family all her life. “I won’t,” Jemima promised, not because it was true but because she did not want to spoil Phinnie’s happiness by selfishly indulging in her own feelings. What she meant, and intended to keep, was a promise to herself to look after Phinnie and make this adventure of hers as happy as it could possibly be. Two days later the ship arrived in New York. From the deck of the liner, the city did not look so very different from London. But as soon as Jemima was ashore she heard the medley of different languages and saw Oriental faces and a good number of black ones, and others that were so fair, as if they were Scandinavian. Everyone was busy. There was an excitement, a tingle in the air, and she fully realized that she had come to a new place, even a new world, and, at least for the moment, alone. Phinnie clung to Jemima’s arm as people eddied around them. Everyone else seemed to know where they were going. Jemima felt a moment’s panic. Then a slender brown-haired man was standing in front of them. He gave orders that their luggage should be brought and conveyed to the carriage that was waiting for them. Discreetly he passed coins to the porters, and their obedience was immediate. Phinnie’s eyes were bright with anticipation, and her cheeks flushed. “Much too long,” Mr. Farrell agreed. “But then the Atlantic is very wide, as I am sure you are acutely aware at this moment. However, you are most welcome.” He turned to Jemima. “And you also, Miss Pitt. You will find New York a marvelous city, full of life and adventure, a meeting place for the world.” He followed the porter across the open space of the wharf toward the way out, and the road. Farrell took her arm to help her up the steps, but he did not reply. Jemima followed after them. Farrell did turn a couple of times to make certain she was not struggling, but the way was easy enough. The ride from the dockside to the center of Manhattan, where the Albrights had their residence, was so fascinating that Jemima felt no wish to speak at all. Once they were off the main thoroughfare, she saw lots of shop signs not only in foreign languages but in lettering she did not recognize: Russian, perhaps? Or Hebrew? Some were undoubtedly Chinese. But it was the people who held her attention. At a glance they were much like those of London. She was interested and somewhat comforted to observe the same fashions. At least she would not look as much a foreigner as she felt. On the narrow pavements groups of young men walked with a little swagger, an air of confidence. They looked around them, surveying their territory, as it were. Was it out of nervousness, or was it the arrogance of those who feel they have destiny in their grasp? It was too late in the year for open carriages, but there were plenty of horse-drawn vehicles about, especially the wagons of tradesmen. But she also saw more motor vehicles than she could remember having seen in London. Sputtering loudly, they moved at what she judged to be no more than ten miles an hour, not as fast as a good carriage horse. “It is your first time to New York, Miss Pitt?” Farrell asked her. She smiled back at him. “I think my American will be better than my French,” she replied. “I think this will be marvelous too,” she said warmly. They were passing through a more affluent area now. The buildings were large and handsome, but newer than those she was used to at home, and taller. She counted one on Fifth Avenue that was at least twelve stories high. How odd that such fine streets should have numbers and not names!